It's been a fantastic year for great games. These were the ten best ones I played. I didn’t play Prison Architect this year. I played it last year, or perhaps the year before. It’s been on Steam Early Access for a while. Whenever I did play it, I really, really enjoyed myself. It’s now finally seen an official release, so I figured I should take this opportunity to recognize it. Prison Architect carries one of those fundamentally satisfying gameplay loops where the human urge to keep everything organized buts up against the mechanics of limited resources and entropy. This combines with the unique prison setting to deliver something that you won’t find anywhere else. You know that Sim City game that came out a few years ago? You know how everyone wanted it to be a return to form for the franchise after many years away? Well, Sim City wasn’t exactly the game the community was looking for, but Cities: Skylines certainly is. Skylines hits all the right notes for a city simulation game with none of the limitations or caveats that Sim City brought with it. It’s a very simple premise, but it’s well-executed and a whole lot of fun to play. Tension. That’s the key word with Rainbow Six Siege. More so than any other FPS in recent memory, Siege does an excellent job building and capitalizing on tension. When you’re the last person alive on your squad, or when you’re waiting for the perfect moment to grab the hostage and run, or when you can hear the heavy breathing of a suicide bomber through the wall. Or hell, how about all of the above, all at once? These are the moments that define Rainbow Six Siege, and the moments that make it more than just another stealth shooter. Layer this on top of solid FPS fundamentals with a wide array of choices in how to approach each situation, and you’ve got a game with fantastic replayability, especially in multiplayer. The beauty and excellence of Rocket League is in its execution. Sure, the concept is pretty novel, but I remember playing a variant of car soccer in Forza a few years ago. Rocket League is more than just car soccer; it’s car soccer, supremely well executed. There’s a unique and beautiful sensation in the boost and flip maneuvers. The stadiums, cars, and particle effects are all gorgeously realized. When you score a goal, it triggers a deeply satisfying explosion that sends everyone flying across the field. The vehicle momentum, turning mechanics, ball handling, and collision physics all feel just right. These are the things that make Rocket League great, and make it something worth coming back to again and again. Mini Metro is a game that felt tailor-made for me. I have a deep, long-running fascination with public transit networks and their characteristics, visualization, and optimization. Mini Metro has turned this fascination into a playable video game and it’s fantastic. Every mission in Mini Metro starts simply and under control. As time progresses, your network is forced to support an ever-increasing number of stations and passengers. You add new lines, trains, and carriages, and you try to avoid leaving too many passengers stranded. Eventually it will all fall apart, but the process of staving off the inevitable is consistently satisfying. Here’s a surprise. As a deeply devoted fan of Dota 2, I hadn’t put much stock in Heroes of the Storm. However, after reluctantly agreeing to play it with friends more than a few times, eventually I came around to it in a big way. Heroes of the Storm is not Dota and it’s not League of Legends. It’s something different, and something delightful in its own right. The diverse maps and their objectives add a nice variety to the gameplay, and the games themselves move much quicker than in other MOBAs. It’s packed full of fun nods to Blizzard lore and presented with that characteristic Blizzard polish throughout. Kerbal Space Program was released this year? Yes, apparently. I remember playing an early beta version several years ago, and then a seemingly-mostly-complete version more recently. In both cases it has delivered a truly unique experience, at times wacky and wildly experimental, and at times totally serious and calculated. Above all else, Kerbal Space Program deserves recognition for being a very different kind of game. Despite its whimsical first impression, there is significant depth here. Succeeding requires learning how missions to space work and carefully planning one out… or you can just slap some boosters together and hope for the best. Either way, it’s a whole lot of fun. I’m always up for a Souls game. In fact, my primary request for the main-line Dark Souls franchise is just that they keep making more. I don’t need them to mix up the formula or develop a new twist on the franchise; I just want Dark Souls, Dark Souls, and more Dark Souls. This is why Bloodborne was such an excellent development. We get to see what a new take on a Souls game can be without needing to disrupt the main games. Bloodborne delivered all the excitement, punishment, and mystique of a Souls game while introducing some original mechanics and a new, rich fiction to explore. After pouring my fullest attention into Fallout 4 for several weeks straight, finishing all the endings and on a path to complete all achievements, I was more than prepared to crown it Game of the Year and be done with it. You can see below why I didn’t, but regardless of that, I thoroughly enjoyed my copious time with Fallout 4. Like previous games in the series, Fallout 4 is primarily about exploring and interacting with a massive, fully realized world, something I find very alluring. On top of that, you have the settlement mechanics, which provide a nice motivation to explore all corners of the world looking for building materials. The combined package is something very special and very engrossing. I was sucked in and blown away. 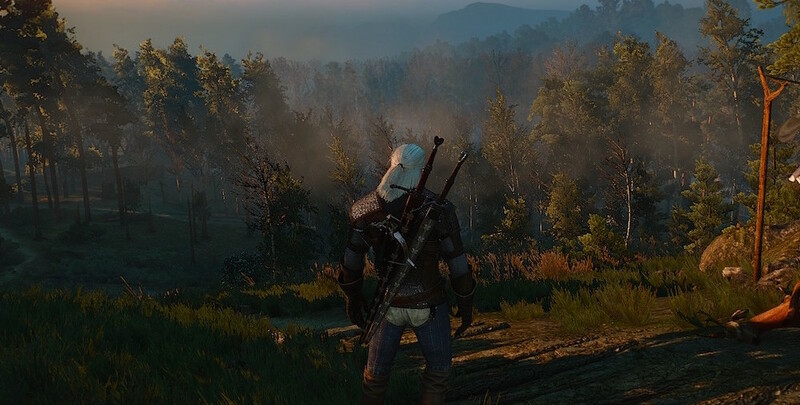 In stark contrast to my Fallout 4 obsession, I had played all of an hour of The Witcher 3 earlier in the year. While I absolutely loved the previous two games in the series, I never found myself with enough time to take Wild Hunt head-on. When I did dip my toes in, the heavily scripted early-game tutorial sequences turned me off a bit. While it didn’t make the best first impression, Wild Hunt made an astounding second impression. When I returned to it recently, I gave it the time to open up and draw me into its world. What lies within is rich, deeply fascinating, gorgeously well-rendered, and well worth a hefty time investment. There’s something unique about the way Wild Hunt engages you. There are the gameplay mechanics themselves, which nudge you along toward completing quests and progressing the story. But beyond the mechanics, the world itself is so deep and complete that it really invites you to just exist within it. Eventually I turned off most of the HUD elements, including quest tracking and the minimap, and just let myself participate in the world. The Witcher 3 is a masterpiece of world building and storytelling within a video game. It’s the best, most well-constructred, most beautiful game I played this year, putting it without question into my #1 slot.